When the Locust Horde burst from the ground fifteen years ago to slaughter the human population of Sera, mankind began a desperate war against extinction. Now after a decade and a half of bloody fighting, and with billions dead, the survivors -- the Gears of the Coalition of Ordered Governments, along with a small band of civilians -- have been forced to destroy their own cities and sacrifice their entire civilization to halt the Locust advance. The last-ditch measures have succeeded, but at an enormous cost: the survivors have been reduced to a handful of refugees. Escaping to a haven on the remote island of Vectes, they begin the heartbreaking task of rebuilding their devastated world. For a while, there's hope . . . making peace with old enemies, and once again planning for the future. But the short respite is shattered when Vectes comes under siege from an even deadlier force than the Locust -- the Lambent, a hideous and constantly mutating life-form that destroys everything in its path. As the Lambent's relentless assault spreads from the mainland to the island, the refugees finally understand what drove the Locust from their underground warrens and sparked the global war. 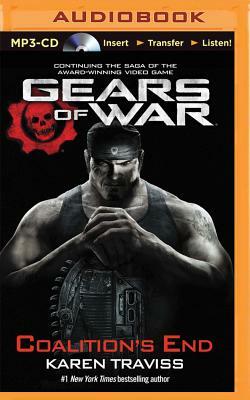 While Marcus Fenix and the Gears struggle to hold back the invasion, the Coalition faces a stark choice -- fight this new enemy to the last human, or flee to the wastelands to take their chances and live like the human pariahs known as the Stranded . . . even as Coalition chairman Richard Prescott still guards one last, terrible secret about the Locust, the Lambent, and the future of mankind. . . .